I live in a little town on the South coast which is currently being inundated with politicians and media types thanks to a certain hotly-contended by-election taking place next week. It’s become a bit of a silly hoo-haa and supplies are running rather low as I daren’t visit the supermarket out of genuine fear that Dave Cameron or Boris Johnson might pop up over the meat counter to canvass my opinion. A frightening thought. Infact, my sister-in-law was enjoying a quiet lunch in a local-to-her-school pub the other day when half of the BBC descended en-masse. I’m just pleased that I elected to conduct my vote via the postal system and can barricade myself indoors until the circus has left town. Honest Politician is a shade from the brand’s Oxymoron Matte Gloss range. Matte? Gloss? How can it be… Well, the clue is in the title. An oxymoron, it most definitely is. 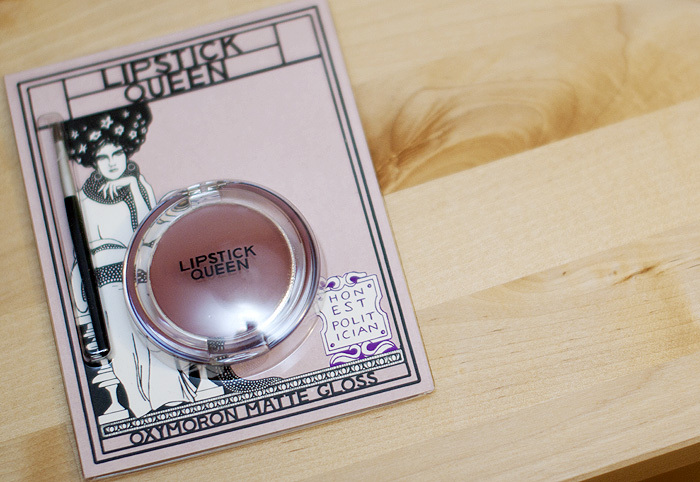 Housed in a cheap-looking acrylic compact, Honest Politician is a neutral-based stain that can be applied to both the lips and the cheeks. To all intents and purposes, it feels like a gloss during application yet dries to a (somewhat) matte finish once on the skin. The formula is quite dry and since I’ve been recovering from being quite poorly over the last 10 days, neither my skin nor my lips are in the best condition to do it justice. Both lips and skin need to be flake-free and my lips are in a state thanks to my complete disregard of doing anything to prevent dehydration. 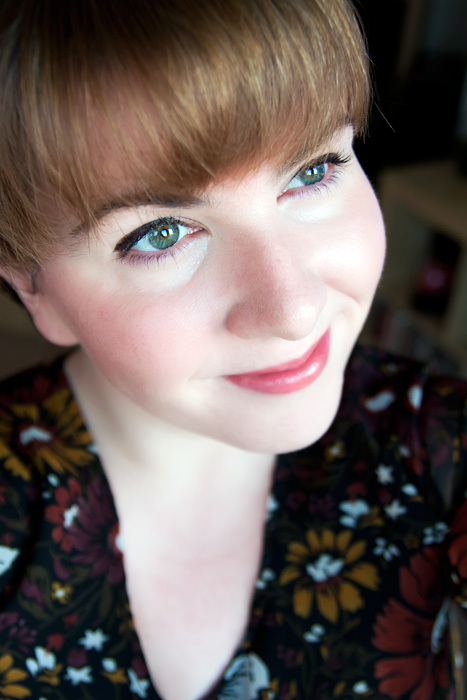 As such, the FOTD below shows me wearing Honest Politician over a slathering of Lanolips. You’ll have to Google Image search for a lip swatch of the product on bare lips, it does have a slightly less glossy finish than my FOTD would suggest. Shade-wise, I’d describe Honest Politician as being a pinky mauve-brown, rendering it thoroughly useful in an arsenal of office-appropriate tones. It’s not the most exciting product in the world and I can’t bring myself to raise my heart-rate much beyond that of a brisk walk over it… but if I were in the market for a work-horse lip/cheek combo that I could hit pan on again and again, Honest Politician should not be ignored. 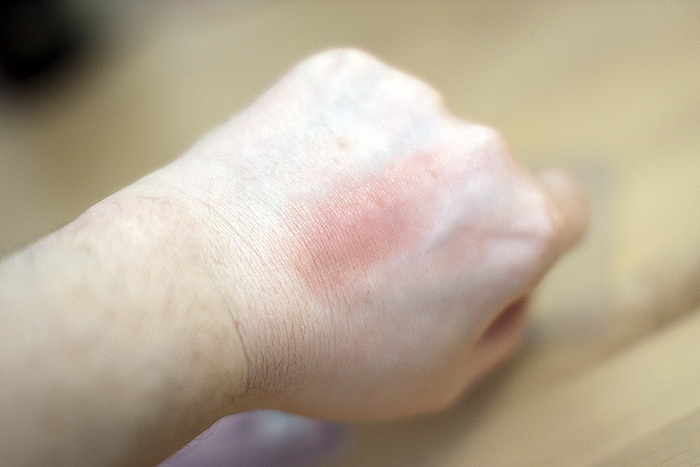 Worn on the cheeks, I found it a little difficult to blend without reaching for my foundation brush (which still had a little product on it). I tried with my fingers and it was hard work. Frustrating but testament to the fact that it isn’t going anywhere once you’ve got it applied. Again, a work-horse. Worn below on the lips and cheeks.